Tony Crocker wrote: As noted before the 373 is the "upper" measurement. When you average it with the 2014 at the base, the resulting 294 is quite in line with Stowe and Smuggs. If the bolded part is true...that would explain most of it. A box, depending on size, would have a significant impact on the numbers from a "method of collection" standpoint. If its big enough, it'll get scoured out, and if its small it will under-catch. A snowboard in a sheltered location is the way to go. Go to the middle of a forest and clear a 30 foot radius area. Measure the snow, as long as you don't see significant drifting. Sometimes the wind does get strong enough to completely wind-blast the snow, even on the dense spruce-forest floor at 3,000ft. Its never going to be perfect, and always open to interpretation as to specific location and surrounding environment. Consistent measuring techniques are appreciated. We can then at least take environment into consideration to compare snowfall a bit more accurately. It's fascinating to speculate why a ski area would do two different things -- measure only at the base, use a box -- to (purposely?) lowball its snowfall stat by at least 20%. This turns the concept of a "brochure quote" on its head. I was going through some old photos and came across a good example of how snowfall can vary depending on elevation, without any threat of rain or warm temperatures. There was a day in April 2013 where a surprise upslope snow event took place. I knew there was a good chance of snow showers overnight but remember thinking just a couple inches were possible. At 5:30am I rolled up the Mountain Road, checked the base stake and found 2.5" but it was snowing fairly steadily as I parked outside the Mountain Operations Center. 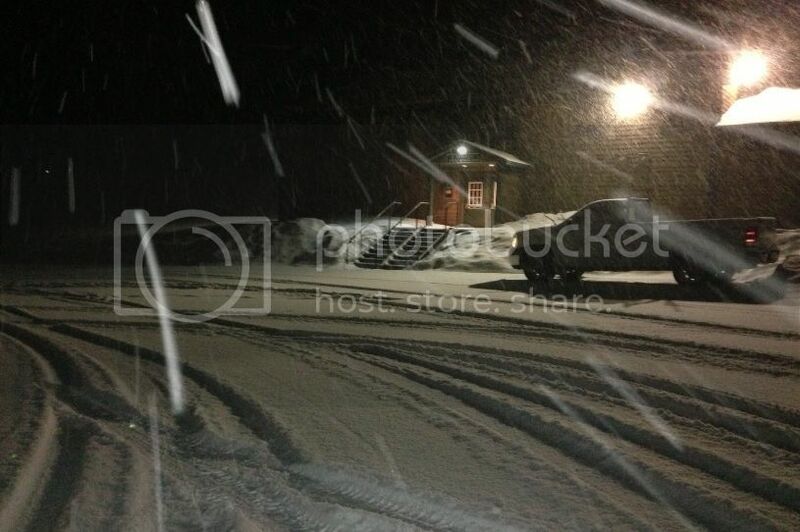 I called the grooming supervisor and he said there was 8" of new snow at 3,000ft and it was still snowing at least 1"/hr. These are the mornings where I get a little nervous because it didn't rain, and I'm looking at around 2-3" outside at 1,500ft. I remember double checking with him and saying, you know there's 2-3" at the base, so I'm just trying to confirm you said 8" so far at 3,000ft? He said "yup, go with it, I'm telling you this is going to be a sweet day." Then at first light when I'm able to get up the lift with patrol, I headed straight to the stake. I remember looking out the window of the Gondola and you could see the snow accumulation grow with each passing minute heading up the line. I got off and headed down grabbing face shots off the summit. 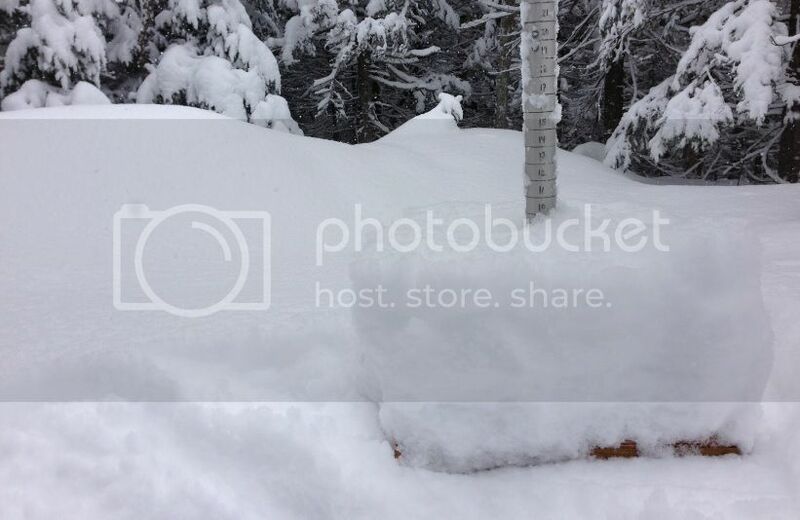 I'm thinking, there was only 3-4" at this point at the base and I'm getting face shots on the upper mountain. This is where a normal skier starts thinking there's 12-18" up high because parts of the trail are over the knees. It doesn't look drifted at all, but it is subtle, favoring one side of the trail or the other. Here's a photo en-route to the snow stake. Look at this and compare it to what the photo at the base looked like. 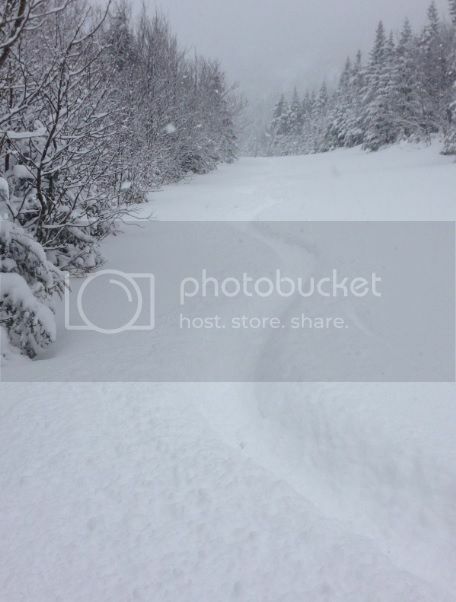 What's interesting about the above photo...I probably skied through 12-14" of fresh fluff on skiers right of that trail. Skiers left (which you can't really tell) was more like 7-10". This is where skiers get excited about accumulations...you sub-consciously seek the deeper line and then go tell everyone at the base that you just skied 14" of snow. Snow board in a sheltered location showed the overnight accumulation by this point at 10"....and with the base at 4" by the time I got up there. So at this time, with no rain or concern about temperatures, there's 4" at 1,500ft and 10" at 3,000ft. This is how you build a 30% difference in snowfall throughout the season with events like this between base and summit. Its hard to see unless you experience it over and over, but its at the point where locals around here get excited and curious even if 1" of snow falls in town...because that could be a huge powder day up high. Or it could just be 2". You just don't know depending on the situation. The base and summit differences aren't primarily caused by rain at the base or marginal temperatures or anything. It just plain precipitates harder up at 3,000ft+ than it does in the lower levels. What also illustrates the elevation dependent precipitation difference is the NWS annual precipitation map. The gradient is insane and its actually known as the most severe annual precipitation gradient east of the Mississippi river. On an annual basis you go from averaging near 80" of liquid equivalent at 4,000ft on Mount Mansfield, to averaging around 50" of liquid just a few miles east towards the town of Stowe. You can get up to 10" of annual precipitation change almost per mile. Just take this gradient and apply it to snowfall. That's how the summit ridges can get 300" and the base area 200" because already in that short distance your annual precipitation is already decreasing. Its possible for the base to average 60" of precip per year while the summit averages almost 80". Just think about that...the Salt Lake City benches get around 20" of annual liquid...Admin's entire yearly rainfall could be equal to the difference in annual rainfall between the summit and the base of Mount Mansfield. It just precipitates harder at the summit. I am new to the snow posts here, though Tony and I have discussed various things snow for a few years. As a meteorologist of 25 years and a skier who grew-up on VT skiing, I thought I could address a couple of points about Jay. First, it is reasonable to expect a modestly higher mean snowfall at elevations approaching the summit over the base elevation. A couple factors are at work here. The onset of snowfall during a typical snow event (trough, frontal passage, etc.) tends to start a bit earlier at elevation, and end a bit later. This is probably more important than snowfall intensity, though higher intensity snowfall at elevation is also a reasonable expectation since lift is enhanced by the topographic barrier. Secondly, the earliest and last snow events of the season, tend to be more elevation/temperature dependent, and hence would bias higher elevations, especially in the Northeast, with a bit more mean snowfall, over lower elevations. The latter is not a major factor, but is an additional factor. I also wanted to address the points around what distinguishes the higher snowfall of northern VT areas over the southern Greens. While Alberta Clipper systems are typically more frequent than the coastal track and the Ohio River storm track, and while the former have more effect on the northern Greens, they are normally dry/moisture starved lows given their origin in central and NW Canada. So I would not attribute Clipper systems to the higher mean snowfall of the northern Greens. Instead, mature, fully occluded, vertically stacked, low pressure systems that park over the eastern Canadian provinces, sometimes for days, or even over a week, will induce a moist NW flow, with Atlantic moisture that has been well entrained into the environment. This stalled low pressure system may have originated as a coastal storm (most common), or as an Ohio River Valley, or Saint Lawrence tracking system. However it got to the eastern Canadian provinces, the combination of cyclonic, moist, NW flow, and excellent orographics, make or the day-in-day-out, around the clock snow and or snow squalls, characteristic of the northern Greens in mid-winter. And yes, with a NW or even better NNW flow, the northern Greens are not shadowed by upstream mountain ranges, like the Adirondacks, the way the southern Greens are. I believe the rain vs snow differences between the northern and southern Greens, on average, is not a major factor. Early season lake effect off of Champlain will give a slight boost to the northern Greens over the southern, but the entire range gets some benefit from Great Lakes moisture. For sure, orographic/upslope flow plays a much more important factor for snowfall in the northern Greens, and with the factors mentioned above, accounts for most of the mean annual snowfall in that region. The south/central Greens tend to get the huge (2-4 foot) snowfalls from slow moving coastal storms that track too close to the coast to be major urban snow producers. They also do well from the Ohio River Valley track, where precip will shut-off right about the time snow would change to rain, and sometimes, they'll see a period of rain before the cold front swings in and changed precip back to snow or snow squalls. Sorry to get a bit long winded, but this stuff has been of interest to me since I was a kid!! jamesdeluxe wrote: It's fascinating to speculate why a ski area would do two different things -- measure only at the base, use a box -- to (purposely?) lowball its snowfall stat by at least 20%. This turns the concept of a "brochure quote" on its head. Three things, only counting from opening to closing date when nearly everyone else starts counting at Nov. 1 and sometimes earlier. I never posted the results on that inquiry to Mont Sutton in summer 2015. The marketing director sent me a daily snow spreadsheet going back to 1999, which was also only from opening to closing date. In 2013 Sutton started measuring summit as well as base, though website quotes remain from the base. Only two years, but summit numbers are 35% higher than base, consistent with what was discussed in this thread. The 40+ years of data on Sutton's website show along term average of 184 inches open to close at the base. My estimate for mid-mountain Nov. 1 - Apr. 30 is 238 inches, indexing missing days to Jay, where I also have daily records. That's in the Killington/Sugarbush range, but well below the Smuggs/Stowe range.